Check out the 3 crystals pictured above, which one are you most attracted to? Choose the one you are most drawn to at this very moment, don’t just pick your favorite color! Listed below is the explanation of your choice and what it reveals about you. Don’t cheat! Go with your first instinct. 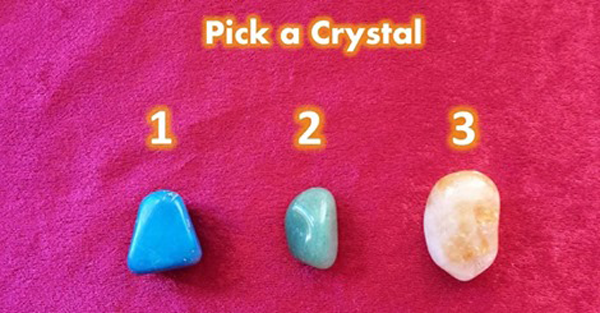 If you chose crystal number 1, you are being asked to work on your communication skills. Do you need to speak up about what is on your mind? Are you being honest about your feelings, to yourself or someone else? Are you listening to others effectively? This stone represents the throat chakra which also incorporates the ears – and therefore is associated with communication in all forms. If you have physical problems in the throat such as a sore throat, it’s time to look at what you’re not saying to someone or you’re being called to speak with more diplomacy. Are you swallowing your words to keep the peace or avoid conflict? Are you speaking with anger? It’s time to assess the emotional issue behind your throat problem. If you have problems with your ears, perhaps you’ve decided you don’t want to listen anymore or are being called to listen to those around you including the whispers of your higher self? Only you will know the truth of this physical ailment. Often children have problems with their ears because they don’t want to hear the word ‘No’ any more or listening to parents fighting. This Howlite crystal has been dyed blue, so this crystal can also indicate that you are not being true to yourself. Are you wearing a mask all the time – not allowing others to see the real you? We are all unique and have individual talents and skills – nobody else is quite like you. It’s time to show the world, the real, beautiful you. If you chose crystal number 2, you are in need of healing, balance, harmony, peace or much love. Green represents the heart chakra which is central to the lower and higher chakras. So this chakra represents anything to do with the heart, balance, harmony, healing and love. Don’t you feel at peace whenever you are in nature? When we take walks in nature, we naturally balance this chakra with the aid of the green foliage. Choosing this crystal represents a need for healing or coming back to center. Have you closed this chakra due to past wounds? Know that when you close off this chakra, you close yourself to receiving love and connecting with people. Perhaps you have difficulty making friends. This chakra also represents self-love, so perhaps it’s time to start nurturing yourself and allowing yourself to feel worthy and deserving of all the best life has to offer. Maybe you’ve noticed that hospitals often have their walls painted green. This is because green is a very healing color and it also represents growth. So now is the time to look at getting some healing of some kind. Of course, any problems to do with the heart or lungs is also an indication that this chakra needs some tender, loving care. If you chose crystal number 3, this indicates issues around the Solar Plexus chakra. This chakra is our power centre or the seat of the will. Have you given your power away to others? Have you allowed others to control your life, instead of taking the reigns of your own life? Perhaps you have become dependent on others and/or have low self-esteem. Now is the time to focus on driving your own life. Spend time in quiet meditation and focus on what you want to create in your life. Yes, you have the power to create your reality with visualisation, setting goals and having the courage to take little steps each day towards your goals. Dream big, and know that you are capable to go after your dreams. Perfection is not needed to start – just start. This crystal is also a great one to use for allowing abundance in all forms to come into your life. Perhaps you have some money issues right now or you’ve been pushing abundance away because you don’t feel worthy or deserving. You are just as deserving as anyone else, so allow abundance to flow into your life. I hope you enjoyed this reading. Your feedback is always welcome in the comments below.